Give the Reward of Choice. 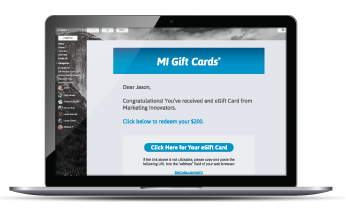 The MI Gift Cards reward code program empowers your teams, customers or channel partners with the freedom to choose their own digital reward, redeemable from a huge selection of name-brand gift cards. 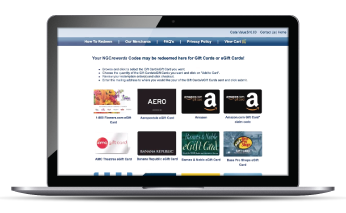 No more pressure to select the perfect gift card, let your recipients choose for themselves! Even little victories deserve to be recognized and a reward code is perfect for those moments. It's easy to plan for an anniversary and it's even more impactful if you figure out ahead of time which brands your recipients really want. Recognize and reward well-being to keep your program participants engaged, motivated and successful. There's a lot of time between the beginning and the end of an incentive push. 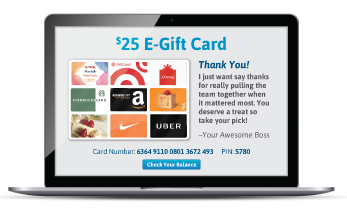 Small, targeted rewards can help keep the momentum moving forward. The potential applications for this versatile product are limited only by imagination. Let's brainstorm together! Simple administration with bulk upload capability. Valuable reporting and tracking fields. Smooth redemption process that exceeds employee expectations. Rewards. Recognition. Incentives. Engagement. 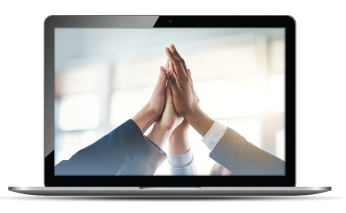 Run all of your programs on one platform.